The automatic publishes will include any rows and columns already in the feed, or that have been added and are adjacent to the feed. (e.g. if new rows are populated via Google Forms, they will be included in the next publish). The publishes run hourly, due to restrictions from Google. If no changes are detected, nothing will be published. 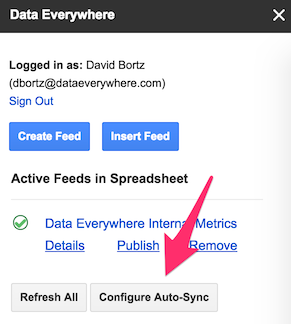 The automatic publishes are all run from Google's servers, so there is no need to have the spreadsheet open, or even be logged in to Google or have your computer turned on for them to work. Close the pop-up. Your feeds will start automatically publishing within the next hour!